The Week in HD – Monday 24th November | What Hi-Fi? "Bold, adventurous and plenty of fun, this is space opera at its best. JJ Abrams should be very concerned." 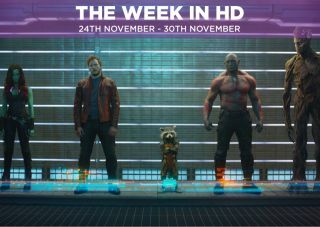 We liked Guardians of the Galaxy very much when it came out this summer, and we'll heartily recommend the Blu-ray release, too. Effectively a film about keeping the MacGuffin (in this case an Infinity stone) out of the hands of some very bad aliens, Guardians brings together a band of unlikely (anti) heroes to save the galaxy from Lee Pace's Ronan the Accuser, who seeks to secure the stone for his master Thanos (voiced by Josh Brolin). It's funny, charming, features a great soundtrack and engaging performances from the cast. It might not escape the formula of Marvel films, but it's too enjoyable to find much fault with it. A superior sequel and one of the year's best films, despite the cumbersome title (too many 'of the'), this film takes the series into territory that's both new and familiar. After leading his tribe of monkeys into the forests of San Francisco, the virus from the end of the first film has left the human populace scattered and devastated and seeking ways to rebuild. When a group of humans come across Caesar's (Any Serkis) troop it kickstarts a series of events that leads to an inevitable outcome: war. The visual effects are terrific and although the ending errs on the more conventional side (and the human characters are under-developed), it's a compelling watch. With Hayao Miyazaki announcing his retirement from animation, we won't be seeing any more films from him in the foreseeable future. His back catalogue is full of classics and Spirited Away is arguably one of his best. The film follows a bratty young girl called Chihiro after she's trapped in a fantasy land where gods, witches and monsters roam. Finding herself working at a bathhouse for the evil witch Yubaba who's turned Chihiro's parents into pigs, can she rescue her parents and herself, or be permanently lost in this strange world? It's fair to say Peter Capaldi's debut series as the 12th Time Lord has been a runaway success. The Glaswegian with his 'attack eyebrows' brought a darker, blunter and grumpier aspect to the Time Lord, while Jenna Coleman's Clara was given a new lease of life with a stronger personality and equal footing with the Doctor. The episodes themselves have been fantastic - self-contained storylines that don't go overboard with the wibbly-wobbly timey-wimey story arcs that showrunner Steven Moffat is usually so fond of. It's a more mature, subtler Doctor Who, and we'll single out episodes like Listen, Time Heist, Mummy On The Orient Express and the wonderfully dark-toned two-part finale as our favourites this year. In fact, this series is so well-contained and consistently entertaining that we'd recommend this box set to anyone not familiar with the world of Who. Also, Michelle Gomez as the mysterious, twisted-Marry-Poppins-like Missy is the icing on the cake. Penguin's Umbrella. Oswald's at it again. After stirring the tension between mob bosses Falcone and Maroni, Oswald steps up his efforts to take over Gotham by becoming the villain we always knew he'd become - The Penguin. And we have to take our hats off to Detectives Gordon and Bullock, who finally step up and show their worth as Gotham's Finest. Crossed. With the group stuck between holding than the fort (or in this case, church) and going on a rescue mission, things are getting stretched and tense for all involved. Plastique. Conspiracy alert! When the army comes into town to investigate an explosion, Barry and his team soon discover that not all is what it seems when they find out when the explosion has ties to the accident that made Barry the Flash. Just a Regular Irregular. A maths genius comes knocking at 221B to ask for the detective's help. Meanwhile, Joan gives Sherlock's new protege Kitty Winters a second chance. Will they see eye-to-eye or be at each other's throats? Bullseye. Showrunner Elsa decides it's time to introduce a deadly new act - The Wheel of Death. On the other side of the tent, Stanley tries to convince con-artist Maggie (Emma Roberts) into killing Jimmy Darling (Evan Peters), but hasn't reckoned with their blossoming romance. Both teams are struggling in their respective leagues, Arsenal managed to do an 'Arsenal' against an injury-ravaged Manchester United team, and Dortmund surrendered a two-goal lead at the weekend, with Marco Reus stretchered off. Dortmund in Europe are different proposition though, and Arsenal will certainly need to buck up their ideas if they want to get a positive result and make it to the knockout round. It's the last of the first-round heats, with five new chefs hoping to impress judges Marcus Wareing, Monica Galletti and Gregg Wallace. Tonight, they'll have just 15 minutes to cook three canapés, while they must also create an innovative and sumptuous dish using one main ingredient: crab. Deliverance. Katrina is in danger and both Abbie and Ichabod face a race against the clock to try and save her. The Secret Origin of Felicity Smoak. Starling City is under a cyber attack, and it's up to resident hacker/computer expert Felicity to save the day. But who is Felicity, really? Does her past harbour a dark secret? Flashbacks have all the answers. Parenthood. Phew. We were dreading they'd end the series with death. But this fascinating David Attenborough-narrated show ends on a high, focusing on parenting in the animal world, and how adults turtles, zebras and elephants protect and provide for their offspring. We're half-way through the suspenseful second series, and Gillian Anderson's Detective Gibson has finally identified Paul Spector (Jamie Dornan) as the serial killer. Now it's time to set the trap and wait. A Fractured House. S.H.I.E.L.D finds itself in trouble again with the US government when Hydra agents posing as S.H.I.E.L.D operatives infiltrate a UN meeting, killing a number of high-ranking officials using the destructive power of the Obelisk. This episode, however, is more about Brett Dalton's Grant Ward, who finds himself being used as leverage between S.H.I.E.L.D and the government. Does he have a plan of his own to put into action? And Agents Hunter and Morse's bickering continues to be the best thing about this show. Seasoned presenter Alexander Armstrong takes a night off from his Pointless duties and hosts this week's satirical news panel. Lovely. Josh Widdecombe, Aisling Bea and Tony Hawks join Alan Davies and Stephen Fry in looking at the interesting side of love and courtly matters. Before the Guardians of the Galaxy, we had the Serenity crew. A ragtag bunch of loveable space cowboys with guns and witty one-liners courtesy of Joss Whedon. We think River and Groot would get along rather well. It's a double dose of Arsenal this week as Arsene Wenger's team take on West Brom. A good result may silence a few of the doubters but West Brom will make it hard for them. Ariadne is formally crowned queen, a stranger appears offering a too-good-to-be-true solution, and Jason fights for glory at a tournament. Honestly, this just makes us miss Merlin. Rage of Caliban. The last time John Constatine performed an exorcism on a child, he accidentally sent the girl to Hell, and then ended up in Ravenscar's mental health facility for a couple of years. So when a young boy is possessed by a malevolent spirit, he's understandably hesitant. Here's hoping we get more backstory and character-building insights from Constantine as he deals with his demons. It's second versus third at the Etihad as last season's champions welcome high flying Southampton. Not many would have predicted Southampton being in the position they are, but they're the meanest defence in the division and could pose City's strike force a problem. Christian Bale's breakout performance is a great one, playing the lead character of Brett Easton Ellis's twisted novel on the American Dream. By turns dark, macabre and frequently funny, it's a film you won't forget in a hurry.